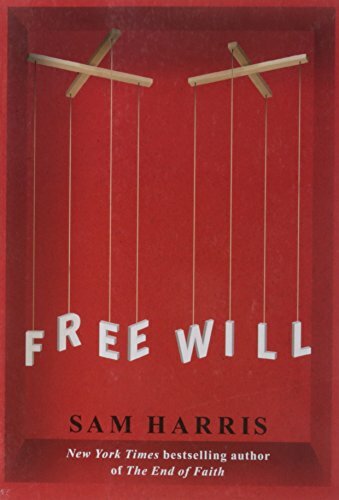 Harris' notion of freedom is really an idea of what we might call maximal autonomy. It's obvious that we don't have maximal autonomy; we aren't free in that sense. Indeed, it isn't so much as possible that we be free in that sense. That is because, as he thinks of it, I act freely on a given occasion only if I myself freely choose to have the desires and affections I then act on, and furthermore I myself freely bring it about that I do have them. But note that the action by which I bring about that I have those desires and affections must itself be free. That means that I must have freely brought it about that I had the desires and affections out of which I acted in bringing it about that I have the desires and affections I presently have. You can see where this is going: for every occasion on which I act freely, there must have been an earlier occasion in which I acted freely. This clearly involves an infinite regress (to use the charming phrase philosophers like): if Harris is right, it is possible that I act freely only if it is possible that I perform an infinite number of actions, each one a matter of bringing it about that I have a certain set of desires and affections. Clearly no one has time, these busy days, for that. Harris is certainly right that we don't have that maximal autonomy; but nothing follows about our having freedom, i.e., the sort of freedom we ordinarily think we have, the sort required for moral responsibility. It's not at all clear to me why Harris devotes most of his energy to arguing that we don't have maximal autonomy. But he does also declare that we don't have freedom in the ordinary sense: "we know that determinism, in every sense relevant to human behavior, is true. Unconscious neural events determine our thoughts and actions—and are themselves determined by prior causes." How do we know that? Harris puts it like this: "Either our wills [i.e., our decisions and choices—AP] are determined by prior causes and we are not responsible for them, or they are the product of chance and we are not responsible for them." Another way to put it: either I am determined to do what I do by prior causes, or I do what I do by chance. In the first case I clearly don't have freedom. But the same holds in the second: if what I do happens just by chance, then too I don't do it freely (if I can be said to do it at all), at least not in a way which implies that I am responsible for that action. This is a familiar argument, and one with a long history. But is it a good argument? I don't think so. Why think that if it is within my power to perform an action, but also within my power to refrain from so doing, then what I do happens just by chance? Maybe I have a good reason for doing what I do on that occasion—then it wouldn't be just by chance that I do it. Last Sunday you contributed money to your church; no doubt on that occasion it was within your power to refrain from contributing. But it surely wasn't just by chance that you made that contribution. It isn't as if you just flipped a coin: "Heads, I'll contribute; tails, I won't." No; you had a good reason for contributing: you want to promote the good things your church does. We Christians think God freely arranged the whole marvelous scheme of Incarnation and Atonement, whereby we sinners can once more be in a proper relationship with God. God did this, and did it freely; it was within his power to refrain from so doing, thus leaving us in our sins. But it surely doesn't follow that he did it just by chance! This argument is a complete failure. There is one further kind of argument that Harris presents. He considers cases in which someone performs an act of horrifying evil: he enters a crowded movie theater and begins shooting. We then learn that this person is suffering from an invasive brain tumor or a serious psychological disorder; this makes us disinclined, or anyway less inclined, to hold him responsible for his action. That's because we think this person was caused to behave in this way by the tumor, and wasn't really free to act in any other way at the time of that behavior. So we recognize that people are sometimes unfree in their actions. But then, says Harris, can't we see that the same really goes for any other behavior on the part of that person, or any other person? If the killer's behavior is determined by previous circumstances and natural laws, isn't the same thing true of the behavior of any human being in any circumstance? He apparently thinks there is no relevant difference between a case in which a normal person kills someone else just for the thrill of it, and a case in which someone does the same thing, but is suffering from a brain tumor "the size of a golf ball in his medial prefrontal cortex." As he says, "There is no question that our attribution of agency can be gravely in error. I am arguing that it always is." I am sorry to say that I couldn't find the argument. Harris seems to think merely pointing to this possibility is sufficient to clinch his case. But that seems preposterous. Some people under some conditions aren't free; how does it even begin to follow that no people under any conditions are free? Couldn't it be that pathological conditions rob a person of a freedom they would otherwise have? Couldn't it be that cognitive malfunction can take away a person's freedom? This is what we certainly think ordinarily. We excuse the person suffering from cognitive malfunction: she is not guilty by reason of insanity, or less guilty by reason of diminished capacity. Cognitive malfunction can take away one's freedom, and with it one's responsibility. But there isn't here the slightest reason to think that those who are not suffering from cognitive malfunction are never responsible for what they do. This argument, like the others, gives us no reason at all to amend this ordinary and deeply rooted way of thinking. I conclude by considering a kind of argument for determinism that seems to me more promising than any of those offered by Harris. Several Christian thinkers have at least flirted with determinism, motivated for the most part by considerations of divine sovereignty. If God is truly sovereign, truly ruler over all, won't it be the case that whatever happens in the world, happens because he intends it to happen? Indeed, won't it be because God causes it to happen? Reformed thinkers in particular have sometimes seemed to endorse determinism. Some people think of John Calvin himself, that fons et origo of Reformedom, as accepting determinism. But this is far from clear. Calvin did, of course, endorse predestination: but determinism doesn't follow. Predestination, as Calvin thinks of it, has to do with salvation; it implies nothing about whether I can freely choose to take a walk this afternoon. Calvin did indeed have invidious things to say about the freedom of the will; much ink has been spilt on this topic, and the question of just what Calvin believed here is vexed. But as Richard Muller, as good a Calvin scholar as one can find, says, "When Calvin indicates that we are deprived of free choice, he is certainly indicating only that we cannot choose freely between good and evil, or more precisely, we cannot choose between performing nominally good acts in a sinful way and performing them in an utterly good way. He certainly does not mean either that the will … is unfree or coerced in any way; nor does he mean that a person is not free to choose between Merlot and Cabernet Sauvignon." And second, we human beings often do what we know is wrong, and are both responsible for so doing and guilty for so doing. But if determinism is true, then on any occasion when I do what is wrong, it isn't possible for me to refrain from doing wrong. And if it isn't possible for me to refrain from doing wrong, then I can't really be responsible for that wrong-doing—not in the relevant sense anyway. We do sometimes say that arterial plaque is responsible for many heart attacks, but that's not the relevant sense of "responsibility." The relevant sense involves being properly subject to disapprobation, moral criticism, and even punishment; no one would consider criticizing or punishing a deposit of plaque. By contrast, if I knowingly do what is wrong, I am indeed properly subject to disapproval and blame. But I am not properly blamed for doing what it was not within my power not to do. On Edwards' view, we seem to lose any notion of human responsibility. These are costs for Edwards' divine determinism, and they are certainly substantial. Edwards perhaps has an initially plausible reason for accepting determinism: protecting divine sovereignty. Harris, on the other hand, seems to support determinism by little more than bland assertion and uncogent argument. Alvin Plantinga is the John A. O'Brien Professor of Philosophy Emeritus at the University of Notre Dame and the inaugural holder of the Jellema Chair in Philosophy at Calvin College. He is the author most recently of Where the Conflict Really Lies: Science, Religion, and Naturalism (Oxford Univ. Press). 1. In the foreword to the late Dewey Hoitenga's John Calvin and the Will (Baker Books, 1997), p. 7.